“Culture” is another one of those buzz words going around lately as companies strive to up their game or reinvent themselves. With the changes in the market after the economic crash of 2008 and the new generations entering the workplace now, the new goal is to make your workplace happier, healthier and higher performing….still all within reasonable cost. But let’s start with defining: What is a “company culture”? Basic definition: Your culture is a set of characteristics that define a business. It is the values and practices shared by members of the company. It involves employee attitudes, standards (policies and procedures) and “rites or rituals” (i.e. Employee of the Month) that have been ongoing and/or influenced by the communities in which the company operates. Let’s not think that this is all based on positive influences. Yes, even negative influences can affect a company’s culture. For example: Is your company known for “still doing business the same way since…”? This may actually come across to potential employees as a company unwelcoming to change. When your company decides it wants to hire a new member to the team, one of the considerations during the hiring process is whether or not the candidate and their skill set will be a “fit” for the company’s culture. The purpose, of course, is to reduce the change of problems/conflicts that may arise if the candidate does not display the same values or behavior as the rest of the team and so that they can quickly (and with the expectation that it will be easily) fit in with the company and hit the ground running in their new position. Companies that have a defined “company culture” tend to see employees as a valuable asset, rather than just a body to fill a position, which typically leads to higher productivity and company loyalty. This is probably the basis why many companies are now working to define their company culture and adjust it if necessary. But, you can actually create a “company culture” and set the tone or is it something that truly evolves over time based on attitudes and interactions of your employees? And how you answer that question will determine 1) how you go about defining your company culture and 2) IF you can improve upon it. Don’t fall into that trap that as long as you define your company’s culture with Mission or Vision Statements and a bunch of policies and procedures that are supposed to “set the tone” for your employees that you have succeeded in setting up a positive culture. What is put down in paper means nothing if it isn’t communicated and follow-up upon by members of your management team. For example: You company may “claim” to operate as a “family” – giving the impression that the employees are close knit, look out for each other and do what they can regardless of title or position for the benefit of the whole company as a whole. But, if your management team goes on a power trip and starts assigning hierarchies and demanding people follow it, then your “family atmosphere” falls apart…and now its just words on a piece of paper. 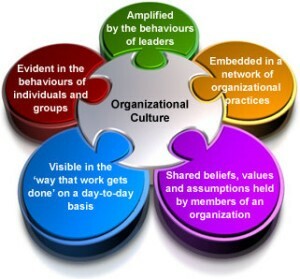 So, start with: What is your company’s culture? Is it already defined? If not, what are you using as an example to create? How it is defined? Just policies and procedures? How do your employees know what the company’s culture is supposed to be? Is it having a positive effect on your employees? Have employee “sick” days decreased? Next, how is your company’s culture being perceived by the public? Do you have a “reputation” in the industry that candidates may consider when applying? Are you or your employees active in the community where people can get to know your employees better? What feedback have you gotten from customers about the general atmosphere or employee conduct/attitudes? Yes, it’s a lot of questions to consider but each answer will help you develop and tweak your company’s culture as time goes on and changes occur within the company and the employees themselves. Coming up with a concept and template that you expect your employees to fall in line with and follow won’t work long-term. Your employees are that “variable” in the math equation for a perfect work environment – they are always changing so you have to watch, monitor and change with them. Previous postWhat If The Motivator Needs Motivating?